Uganda Communications Commission (UCC) in a joint statement with telecommunications companies – Airtel, MTN, and Africell – announced that with effect from July 31, there will be no more distribution of airtime scratch cards. This implies that to top up airtime on your phone, you will only be using electronic payment options. The move to ban airtime scratch cards was first announced in late March of this year, following the kidnap and murder of Susan Magara, a daughter of a prominent businessman close to the first family. Magara’s death had been preceded by a series of other murders, and this prompted the government to halt the issuance of sim cards, citing that most criminal elements were exploiting the existing casual process of acquiring sim cards to evade capture by authorities. The communications regulator also announced in the statement that telecom operators should also prepare to stop selling airtime scratch cards since some of the criminals were masquerading as airtime vendors. To strengthen the sim card registration process, telecom companies have since acquired digital equipment to use and the sim card replacement process has also been made more rigorous. But the issue of controlling who sells and distributes airtime scratch cards remained a hard puzzle to crack. 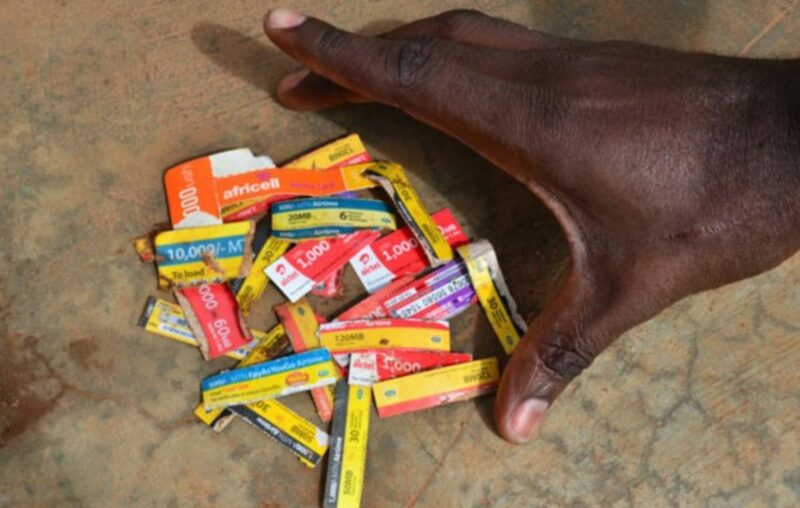 According to Ibrahim Bbosa, the consumer affairs manager at UCC, telecom companies found that controlling the distribution chain of scratch cards was going to be impossible for them and they agreed that airtime purchases be conducted only electronically. “There are concerns of criminals masquerading as airtime vendors & hawkers. @UCC_Official did require registration & accountability of all persons handling SIM cards and airtime products. Telecom operators demonstrated that accountability for retailers & hawkers was not practical,” said Bbosa on Twitter. Come August 1, it means some people who have been getting some commission from selling airtime scratch cards, will no longer be able to. UCC says that, for a person to sell airtime now, they will have to first register with telecom companies. Will stopping selling of scratch cards help in solving crime? Your guess is as good as ours. First of all, while UCC says that some of the criminals were masquerading as vendors, the trade was also offering a source of income to some individuals. So, by taking away their source of income, it could make them more desperate to resort to other desperate sources of income: crime. Telecommunication companies are also going to lose money since they had already shipped in the scratchcards which they may not sell out by the time of effecting the development. To cover for the losses, they could strategize with schemes that might affect customers. Telecom companies are also interested in the project of banning scratch cards, given that their mobile money services are now going to be stronger. There are more than twenty-three million registered mobile money users in Uganda, according to UCC. IS THE MOVE RADICAL? Check the numbers. By the end of December 2017, there were 24,948,878 Mobile subscribers. 23,362,532 (93.6%) having active Mobile Money accounts. It is safe to say that 94% of mobile subscribers have the option to self-load airtime using mobile wallets. Below is the full thread in which Bbosa talks about the discussions that went about between UCC and telcos to reach this agreement. The @UCC_Official has notified the public on the move to phase out physical airtime scratch cards in Uganda replacing the same with digital alternatives. Is the move radical? Is it applicable in areas without Mobile Money? Moreover, why the ban?